I’m not one of those people who freezes soup, although I do occasionally try to be one of those people, and then find the poor victim in the back of the freezer way too late. To avoid that tragedy, I’m usually simmering up a pot a few times a week, and there is almost always a lentil variety in the mix. It’s flexible and easy and takes to new flavors like a champ, so I’m always tinkering. I rendevous with all manner of lentil; de puy, black lentils, red, you name it. But I always come back to the basic, dependable and oh-so-flavorful brown lentil. It’s my little black dress. And they’re like, what, $1.50 a pound, even for organic? That’s lentils for weeks, my friends. This week, I had a windfall of smoked paprika. It’s one of those spices I love, but they don’t sell it where I usually do my shopping, and if I don’t make a special spice trip, the jar can languish empty for months. So when I picked up a beautiful fragrant baggy, I wanted to make up for lost time and use it in copious amounts. Add to that the scrumptious kalamata olives I had leftover, and some baby spinach that was dying to be used, and there you have it! A lush, flavorful, healthful soup that was just amazing served with a crusty baguette smeared with homemade hummus. ~ Since olives are salty, wait until after adding them to decide if you need more salt. ~ You can use hot smoked paprika instead of sweet, but do remember that it’s hot! So your soup is gonna’ be spicy. Start with a tablespoon and go from there. Preheat a 4-quart soup pot over medium high heat. Saute onions in oil with a pinch of salt until translucent, about 3 minutes. Add garlic and saute for 15 seconds or so, then mix in the thyme and paprika. Add the lentils, broth, salt and pepper. Cover and bring to a boil. Once boiling, turn heat to medium and cook for 25 minutes, stirring occasionally, until lentils are almost tender. Add the tomatoes, crushing the tomatoes with your hands to get them into small pieces, as you add them. Bring to a boil, then lower heat to simmer for another 20 minutes or so, or until lentils are very tender. Add spinach and olives and stir frequently until spinach is wilted and velvetty. Add water to thin, if necessary. Taste for salt, and let sit for 10 minutes or so for flavors to marry, then serve! now i know what i’m having for dinner tonight, this looks glorious! can’t wait to try this! all my favorite things! Boy, have you been busy lately!!! I love it!! This sounds divine…and I know what I need now at the grocery store…Thanks…and keep ’em comin’. This is great!!! AND..I’m getting ready to make that chickpea tofu you told me about. Tuesday, I think….yum. this looks amazing. i love soups. loooove the idea of olives in the soup! I’ve never done that. I can’t wait to make this, tomorrow. All the ingredients were sitting, at the ready, before I even saw this recipe. It was truly meant to be! This looks like a great dinner! I am trying to incorporate more healthy, low cal vegan dishes to my dinner rotation, and this looks great! I just polished off a big bowl of this for my dinner. I made it with smoked paprika (not sweet) and it was ridiculously awesome… Especially paired with some big hunks of sourdough bread. Isa, you’re a genius! Every one of your recipes that I’ve tried has been wonderful. I would love to see a lentil soup recipe that doesn’t call for onions. Sadly, onions just don’t agree with me. Just leave out the onions. I make a soup like this, also adding capers and sun dried tomatoes, sometimes also sweet potatoes, mushrooms… finished with balsamic vinegar. I call it Italian Lentil Soup. So yummy!! Jeannie, leave out the onions if you don’t want them! This is soup… anything goes! Okay, I broke down and made it tonight instead of tomorrow…and I’m in BLISS. What an amazing soup. Thank you for giving me a new version on lentil soup! Brown lentils are still my favorite and I could eat lentil soup everyday. I was just looking for a soup recipe to use some up wilting spinach. I made this for dinner tonight and it’s amazing! So smoky and delicious. Thanks, Isa! Oh thank you for sharing this magical remedy for the frigid winter dreary greys! It looks superyumful and perfect with a nice dense rustic Italian bread! Cheers! It isn’t easy getting hold of fire roasted tomatoes here in the UK. Is there something we can substitute? Maybe sun-dried tomatoes or ordinary tinned tomatoes with liquid smoke? You can just use tinned tomatoes, no big deal. I’d skip the liquid smoke. This sounds great! Like you with the freezer, I feel like I always buy lentils in bulk (because they are so cheap), and then they get pushed to the back of my cabinet where they sit there for weeks. I’ve been on the lookout for new lentil recipes to avoid this, so hopefully I can whip this one up soon! I am one of those people that freezes soup – any soups that don’t freeze well? Tips for freezing/thawing? No fire-roasted tomatoes where I live (Mexico)… how can I substitute fresh tomatoes and make them taste like something? Thanks! I’d just chop em up and toss em in! Maybe a dollop of tomato paste, too. This sounds like a great soup to enjoy now that spring is finally here and things are starting to warm up. Can’t wait to try it! WOW! I need to make this! Thanks, isa. Great soup…devoured a huge bowl of it last night! Very filling and easy to make. Thanks!! Any thoughts about slow-cookering this? Yeah, I ate my lazy biscuits this morning. Yum! Made this to tonight and will definitely make it again! You did it again, I am not ashamed to say between the 2 of us we nearly finished the whole thing. This was outrageously delicious. Absolutely perfect! Thank you! ……..and now i know what i’m having for supper tonight! i only have fresh dinosaur kale and black lentils, though. i am optimistic it’ll still be fabulous! thanks for what i anticipate will be another stellar soup creation, isa! Yes Yes very good, no spinach so added chard worked out fantastically. Another keeper! Had this for dinner tonight, it is absolutely delicious and smells yummy, too! I just had this for three consecutive (non-breakfast) meals. Dynamite! I will make this again – thank you. i made this last night…my new favorite! tonight for the second time around i added field roast apple sage vegan sausage to it….a perfect flavor addition to the sweet smoky paprika! Made this tonight and although it came out a tad on the salty side it still tastes amazing. I’ll cut down the salt next go. This recipe looks fantastic and I absolutely LOVE the part where I get to crush tomatoes with my hands! Loved it! Added some kale as well and all of us preferred the added texture. I made this last night and it is, hands down, my favorite lentil soup now. Thanks, Isa! Just made this soup for lunch and ate two bowls. Will probably eat more for dinner… Eating like this has made becoming vegan at 49 easier than I thought it would be! Thanks for another amazing recipe! I made this tonight for my daughter and myself and it was soooo good!!! I didn’t have smoked paprika, so I used a tablespoon of regular paprika and 2 teaspoons of chipotle powder. it was good and spicy!!! We both agreed it was our new favorite soup! This is fantastic and will definitely make it again…and again…and again. A keeper!! Just pre-ordered your new cook book on Amazon, can’t wait! Thanks for the great recipes! As someone who is new the being vegan, I am never disappointed in your recipes! C’est absolument délicieux ! Merci. Amazing soup! I made it on Sunday and now I’m sad that it’s all gone. Definitely going to make it into my regular rotation! I made this last night and cannot stop raving about it. I didn’t have smoked paprika, but it didn’t seem to matter that much.. as I got two big thumbs up from my vegan bf. I also took the advice of previous comments regarding not adding much salt, as the olives lend a lot. Isa, I cannot get over how ALL of your recipes i have made to date are awesome and delish! Thx! 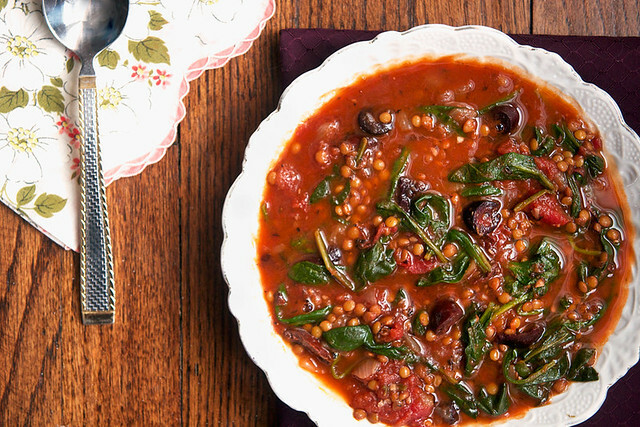 Smoky Tomato Lentil Soup With Spinach & Olives | Clare Cooks! I am making it and don’t really like the taste. This recipe is different but you have to have a taste for the ingredients. But I can see why it got rave reviews. I am not adventorous enough I think. You definately need a cup or so of water to thin it. Otherwise it is fine. ENJOY!! I am curious, why do you wait to add the tomatoes? If you added them with the broth, you could probably cut a good 10-20 minutes off the overall cooking time. This recipe sounds delicious by the way. Lentils take longer to cook when they’re in thick tomato sauce, so I wait. Hi, I have a tupperware box full of green lentils which I cooked yesterday and I was planning on using them for this soup – how would that work in term of cooking times? Can it even be done? p.s. : Isa, I simply love your recipes. They’re slowly turning my mother and my friends vegan! Awesome. Just made it. My stomach is doing a happy dance. Thanks! Made this for dinner tonight, just fantastic. Perfect blend of flavors. Thanks for the recipe!! I liked – but didn’t love – this soup as I found it to be a bit bland. I’m going to increase the smoked paprika, thyme and garlic the next time I make this. This soup was incredible! I’ve never been a huge soup person, but I think this recipe may have converted me. I feel so fulfilled… and I’m excited for all the leftovers that I’ll have for the rest of the week. I only had 12 or so oz. of canned tomatoes, so I just substituted the rest with fresh tomatoes and some extra salt and paprika! Excellent recipe. I’ll make sure to try you black bean and quinoa recipe later this week. My Favourite Blogs (& the Recipes I Have Tried) | the taste space - steam, bake, boil, shake! Oh my goodness, I think I have a new favourite soup! I used regular tinned tomatoes as the exitingly-named fire-roasted ones don’t seem to exist in the UK.. I also used a LOT more smoked paprika (I just love it so much) and added some chipotle and garlic sauce I found. I made this soup last week and loved it so much that I’m preparing a second batch tomorrow. I didn’t make any alterations to the recipe, nor did I need to since this is one of the most perfect soups I’ve ever eaten. I love you, Isa! You’re my culinary heroine! O.M.G. This is incredible. I couldn’t stop eating it. I made this yesterday for Thanksgiving, oh man was it good. I omitted the olives as there were some whiny non-olive people at my table – why do I dine with them? – but I’m excited to redo with the full ingredients next time. So so good. OMG! Made this the other night (with a few revisions because I didn’t have olives and spinach on hand and was too lazy to go to the store). I added organic frozen corn instead cuz I LOVE corn and lentils together. Seriously think I could eat a trough full… This is definitely in the regular rotation! I made this last night with some minor changes: I substituted kale for the baby spinach and added Field Roast Apple Sage sausage. it was absolutely delicious. Thanks for another amazing recipe, Isa! This was excellent. I’ve been focusing on eating more veggies, and this soup is great with the spinach. The lentils fill me up and it’s been fantastic for lunches during the week. We are not vegan but saw this recipe and have made it twice already this fall/winter because it is so yummy. We have an annual mid winter soup party to beat cabin fever and this year we made a double batch of this. It got rave reviews from all kinds of meat eaters and several people who were gluten and lactose intolerant. Thank you for such a great recipe! Terrific! Really easy and healthy to make. I am always looking for new soup ideas that are vegetarian and hearty! Thanks! I just used home canned tomatoes that I had on hand and added a bit more smoked paprika! Made it, love it. I eat lentil soup a few times a week, so this was a nice twist. This was just right, a perfect match for a snowy Pittsburgh Sunday! I had just bought really good olives and had everything else on hand. It was easy and a big hit with some of my coworkers today at the lunch table. 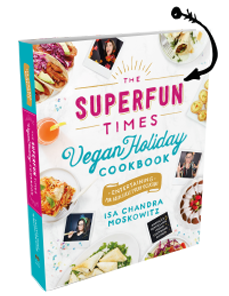 I am new to your site and recently bought one of your cookbooks , you are making my journey into veganism interesting but not not overwhelming – thank you ! I am one that used to have meat with every mean, but I have had a life changing experience and a wake up call when my domestic partner had to have bypass surgery. I now have become a vegetarian for the most part. I am always looking up new recipes and I find vegetarian cooking to be more challenging and new, but I am also having a lot of fun with it. I made your soup recipe last night and I loved it. It was so simple that I plan to make this anytime I don’t have a lot of time to spend in the kitchen. I was in the mood for kale so I substituted the spinach with kale. Because I have lived in Texas my entire life, I tend to like things with a little kick to them. I added a little chili powder, cayenne and some red pepper flakes as well. I am glad I didn’t add a lot of spice as the olives really complimented the flavor of the soup well. Thank you for the wonderful recipe. I will definitely make this again and experiment with it. This was great! I messed it up a little because I was out of canned tomatoes and used tomato paste. I added a squeeze of lemon at the end. so tasty. but i used fire roasted tomatoes with chipotle and it was too spicy. My absolute favorite recipe of yours so far! I made a pot just about every week this winter. I am due to have my baby next week and just made a pot to freeze for afterwards. This soup is magically delicious! Thank you! Since it’s summer do you think Swiss chard instead of spinach would work? I have an abundance! Made this for a pot luck over the weekend and got some great feedback. it is soooo good. Thank you for sharing this wonderful soup with us. I loved it! Great flavors and I didn’t even have the smoked paprika. Making for the second time! The smoked paprika makes this soup amazing! Serve with cornbread! Just made this for the first time and it was amazing, even frozen the remainder for another day. I didn’t add extra water and served it with brown rice like a curry 🙂 and I will definitely be using smoked paprika again! I’ll right away take hold of your rss feed as I can not find your email subscription hyperlink or newsletter service. Do you have any? Kindly let me realize in order that I may just subscribe. Thanks. OK I messed with every quantity, used fresh tomatoes, celery, kale, tomato paste, and green lentils — but it’s AWESOME. Could use some diced fingerling potatoes too. Goodbye boring lentil soup! I can’t do olives! I wish I could, I even love the smell of them, but they just taste like pure poison to me. I was considering making this without the olives- but does anyone have a suggestion for a substitution that can still add some of that meatiness or brininess? Fire-roasted tomato, beans n' greens stew with capers - Eat Well. Party Hard. I made this tonight for the first time and I loved it. I read a comment that said it was not flavorful – they must have made a different recipe. Really delicious and flavorful lentil soup. Can’t wait to try other of your recipes and I am not a vegetarian. Chickpea piccatta coming up soon! Forgot to add that I am going to try it in a pressure cooker to cut down on the cooking time. I think the favors will meld perfectly in a PC. Sounds lovely … Do you soak the lentils first? Delicious!!! I made last night and it was such a hit for my and my husband. I must admit, I was skeptical when I read this recipe (I’ve never cooked with lentils before), but WOW!!! I made a few adjustments — added a dash of white wine vinegar, used red lentils, and only cooked for 30 min total — and it was absolute delicious. That smokey, sweet paprika is really amazing. Thank you so much!! Girl, this was such a delicious recipe. Thank you so much. My husband and I both loved it! Saved this recipe in a bookmark to make and now I go and it’s disappeared? Is it just for me? This is one of my favorite soup recipes! Thank you so much for sharing this. The only change I make is to use regular paprika (not a huge fan of smoked paprika in general). I’ve planning to make this tonight for about the 10th time and figured it was about time to leave a reply 🙂 THANK YOU! I made this for dinner tonight but used 4 cups of broth rather than 5 cups, simmered it to reduce it then served it over rice. Everybody loved it!!! This is fantastic. I love the sweet smoked paprika. It gives it such a different/wonderful flavour that I’m not used to. This one is going in the rotation because that’s how much I love it! My husband and child also loved it! Made this last night as we are about to get hit with some awful, super cold weather. I doubled the spices, but it is absolutely delicious and the perfect dish to knock away winter’s chill. I also added crushed red pepper for some heat and served with a little bit of vegan Parmesan. Loved it! Ok I’m joining the club – this soup is AMAZEBALLS! I just made my second batch, and made it a double 😉 I decided to rinse and soak the lentils prior to cooking (to clean and for digestion) and countered it by using 4 cups of stock. We don’t have fire roasted tomatoes that I could find around here (Fremantle, Australia), so using tinned chopped tomatoes instead with smoked sweet paprika. I didn’t add liquid smoke as I was happy with the taste, but perhaps for my next bowl… I’ll try it “to see”. I’m (kinda) doing the 5:2 fast diet and ~400mL of this soup makes a tasty and filling lunch, that is actually the envy of the office. Thanks for such a yummy and simple recipe. I’ve recently bought your Appetite for Reduction book and have poured over the recipes, bookmarking a many. I really like your writing style. Dang, it was tough to find fire roasted tomatos. I accidentally bought Fire Roasted Tomato Pasta sauce with crazy poor label design… but I used crushed canned tomatoes and it turned out super good. What a good one pot recipe! Delicious and I can be super lazy. I love everything in this. I am omitting the olives for mushrooms, as my husband does not like olives. But the whole house smells so good and cannot wait to taste this!! Silly phines, my name is Tracy. Amazing recipe i loved it!